A bride’s sudden death on the day before her wedding. The Girl’s House takes the best of suspense and condenses it into a tale about pursuit of the truth—set among the ancient morals and complicated family relationships of an Iran running earnestly towards modernization. The film is turning heads as director Shahram Shah Hosseini’s breakaway from his usual comedy films. 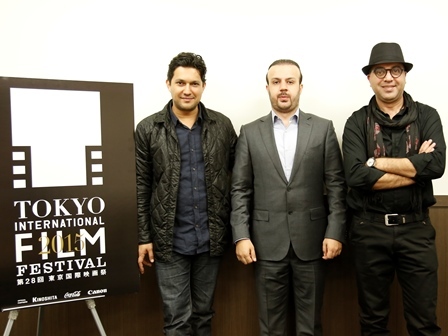 The director visited Japan together with producer Mohammad Shayesteh and popular star Hamed Behdad, who plays the bridegroom. Until now you’ve worked on three comedy films. How did you get involved in a serious film about the mysterious death of a bride the day before her wedding? Director Shahram Shah Hosseini (Director Shah Hosseini below): I started out making comedies, but I also had the will to make a film that depicts social problems. I also had the confidence that I could skillfully depict these social problems. When I received the screenplay, at first I read it and felt confused about what to do, but when I was finished I thought, ‘I absolutely want to shoot this’. Essentially, I was attracted by the strong intrigue of suspense. What did you think was ‘intriguing’? For women, I think the subject would feel particularly scary. Director Shah Hosseini: As a man, when you are going to get married to a woman, you must start a new life and forget about her past, particularly her relationship with other men. For a man, this is an enormous challenge. This was also true for Hamed Behdad’s character, the bridegroom. I think this challenge would be the same for women, but in the film women are portrayed as being at the disadvantage. Is this still what it’s like in Iran? Although he cared about his fiancé Samira’s past, Mansoor decided to marry her anyway. But then she is suddenly dead, leaving him shocked. What impressions did you have about playing this character? Hamed Behdad: It’s said that sometimes men are dishonest or malicious, but that’s a conclusion drawn from just one negative side. While humans can have that side to them, they can also be kind and considerate. I think that those two sides come together to form a complete person. We receive a role and then play it, but sometimes the characters aren’t always so clearly black and white. There are many times when we must become grey, and I think that grey is the truth of humans. The film addresses the religious customs and traditions that still run deep within a modernizing Iran, and adds to it the intrigue of solving a riddle. Director Shah Hosseini: I wanted to shoot the details as finely and accurately as possible. The most suspenseful point was the scene where Mansoor’s fiancé goes to the gynecologist together with his mother and his younger sister. I can’t say in detail, but anyway, up till that point there are lots of small questions and small answers. The foundation was laid, so to speak. For this reason the gynecologist scene exists. If that scene wasn’t there, the film wouldn’t have had the power to draw the audience in. The flashbacks were clever. What was your aim with them? Director Shah Hosseini: A long time ago, when you wanted to explain a tale that had lots of stories going on at once, it would be called a ‘Alejandro González Iñárritu-esque film’. From our Eastern perspective, a ‘moment’ is incredibly important. In order to explain this ‘moment’, in the film we distance ourselves from the past and explain it after an interval. The flashbacks are born when we are in a place distant from the past. So perhaps the meaning of these are a little different from normal flashbacks. As a producer, what attracted you to the film? Mohammad Shayesteh: Behdad, who plays the role of the bridegroom, brought it to me. Parviz Shahbazi, who is a famous director in Iran and who wrote the screenplay, wanted to make it at first, but in the end Shah Hosseini became the director. Anyway, when I first read the screenplay I was really captivated by one scene, and I decided that I absolutely had to participate in funding the film. That scene was when Mansoor and his fiancé speak about past loves while in the car. When I put myself in the head of the man in the scene, asking questions like “Have you ever held someone’s hand? Have you ever dated someone?” I could really sympathize. I thought that this was a story that applied to me too. I was happy that Behdad, who is popular among women, was playing the character, but this isn’t a film directed at women. To be honest, I invested thinking there would be 50% chance of the money to come back. But I absolutely wanted to do this project. The film features a lineup of popular and talented actors like Hamed Behdad, famous for No One Knows About Persian Cats (2009), About Elly’s (2009) Rana Azadivar as Samira, and Babak Karimi, who won Best Actor at Berlin International Film Festival for his role in A Separation (2011), as Samira’s father. Director Shah Hosseini: Parviz Shahbazi wrote the screenplay for Behdad, so both the producer and I thought that there was no one else for Mansoor other than him. With Samira, I wanted to get someone a little less well-known, someone who was more of an amateur and in the middle of learning acting for screen or stage. But the producer said that we absolutely should use a famous actress. In the end, he paid quite a fee for it on our behalf. Director Shah Hosseini: “Don’t judge me.” I think that is conveyed through the entirety of it.